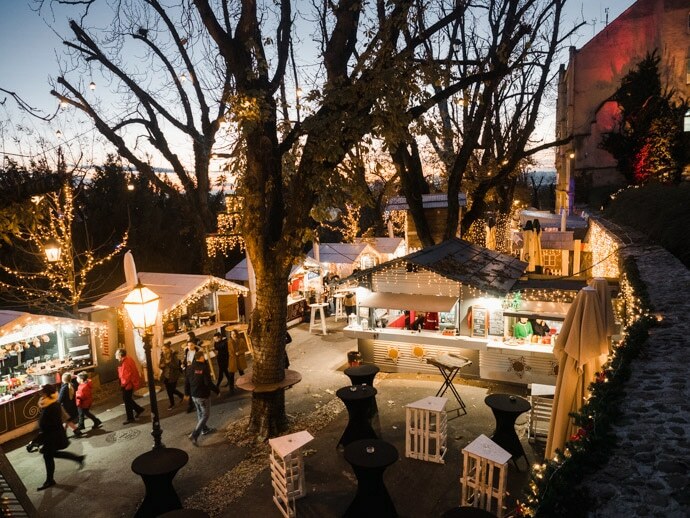 If you’re looking for the best Christmas markets in Europe, then Zagreb Christmas Market in Croatia should definitely be on your list. Perhaps the best part about it is that everywhere you go in Zagreb city centre, there seems to be something magical around the corner. 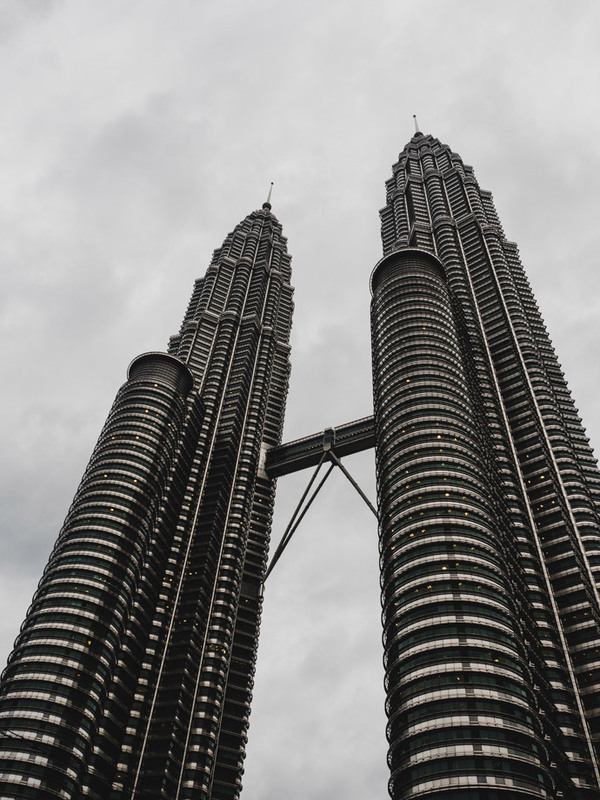 It’s not just in one location, and each location has a different feel and experience. 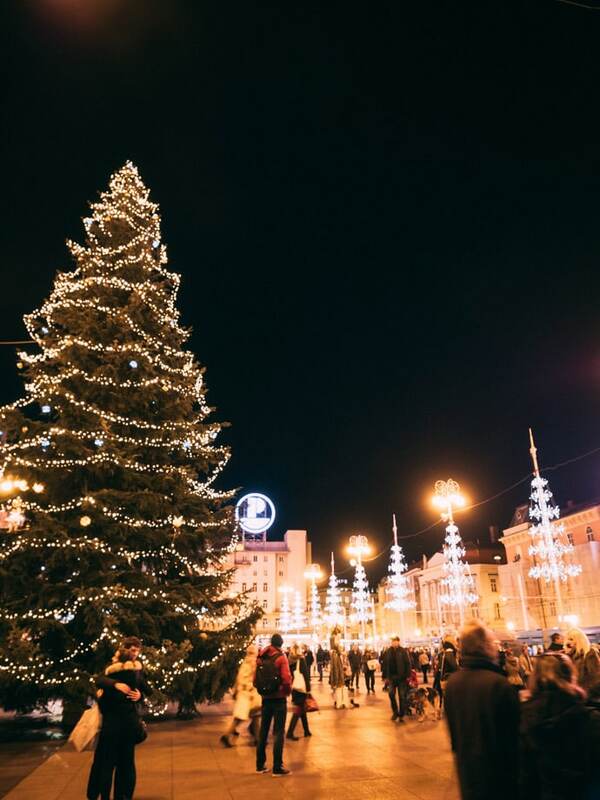 Voted the best Christmas market for 3 years in a row, we were so happy to be in Zagreb to experience the Zagreb Christmas Market, otherwise known as Advent in Zagreb. 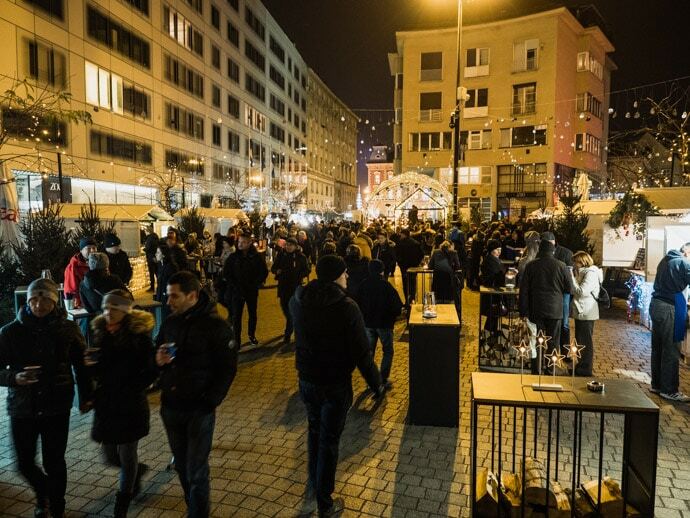 Here is everything you need to know before you go and our Zagreb Christmas Market review. 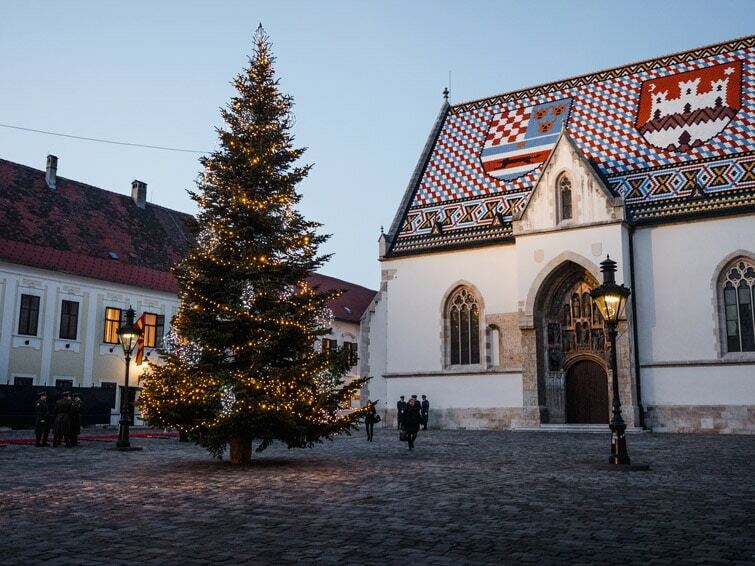 Why Visit The Zagreb Christmas Market? 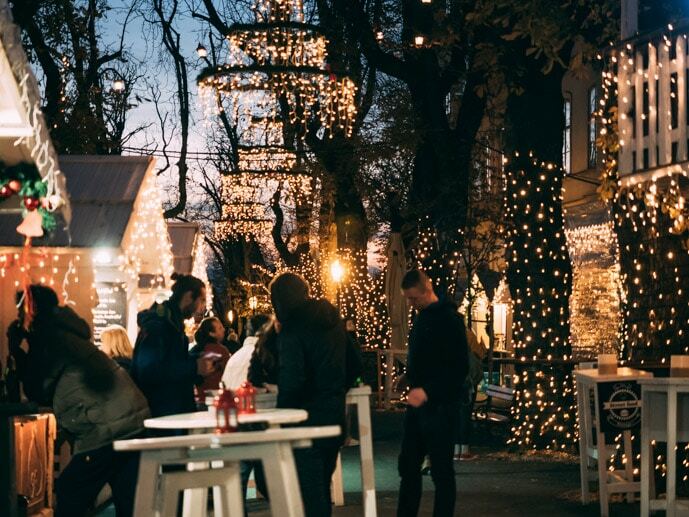 There are so many reasons to visit the Zagreb Christmas market. 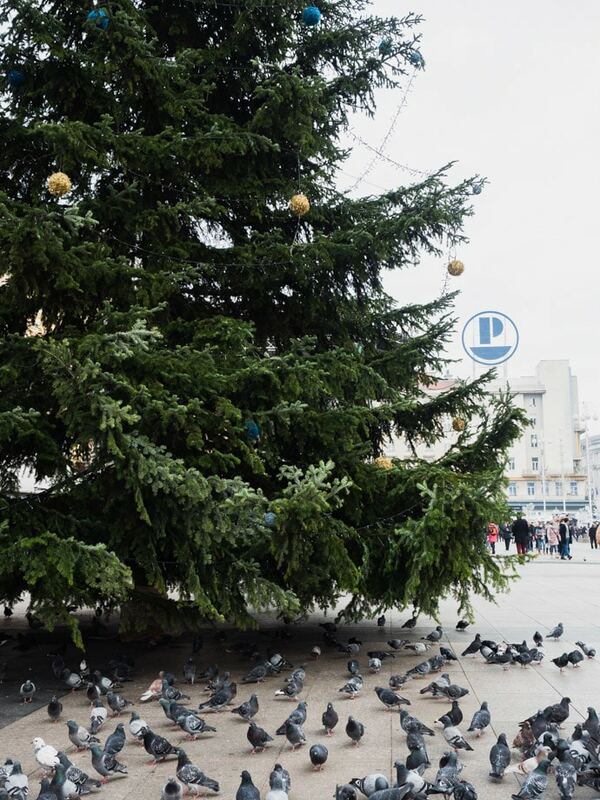 As mentioned, one of the things we loved about it was that it’s not just in one spot but spread out over many different locations in Zagreb city centre. 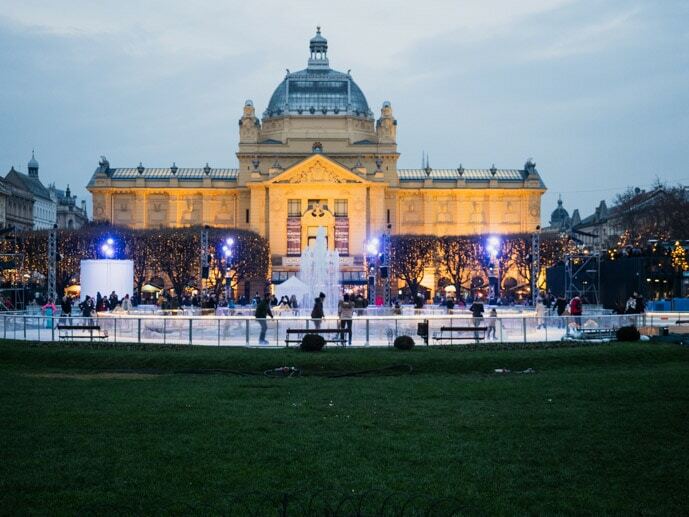 One of the main highlights of Advent in Zagreb is the outdoor ice skating in the park. It’s a beautiful area, a great ice skating circuit and we had so much fun doing this, even though our skating skills are poor at best. 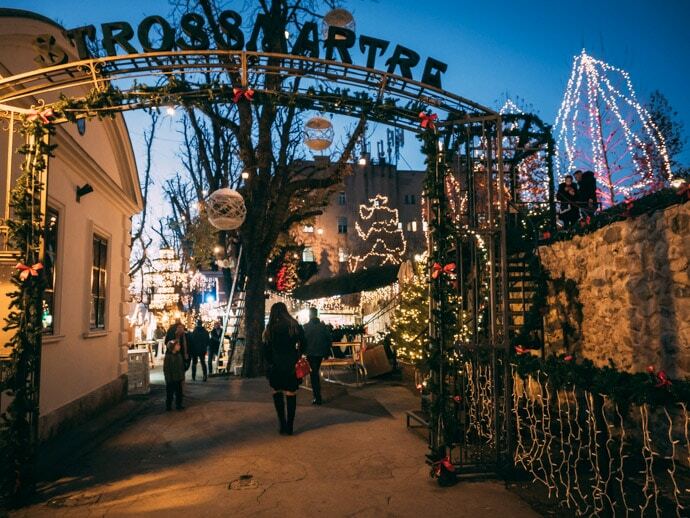 Another thing to note is that the Zagreb Christmas market is actually quite affordable, making it so much more accessible. 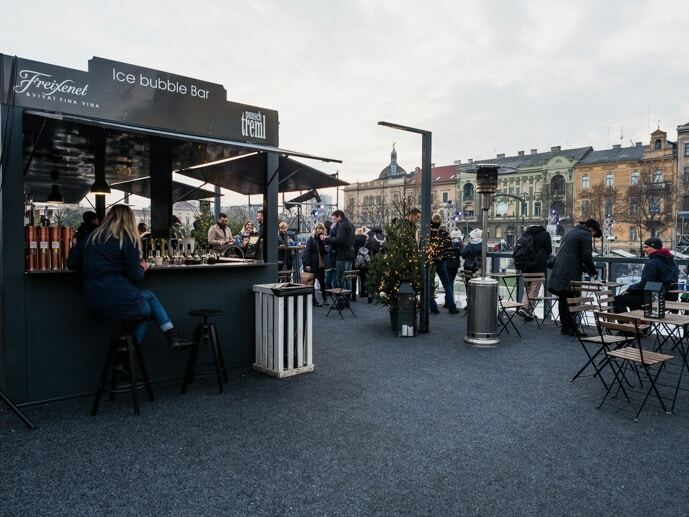 There is plenty of free entertainment, beautiful decorations around the city, and for an event, we found food, drinks and activities such as ice skating, really reasonably priced. 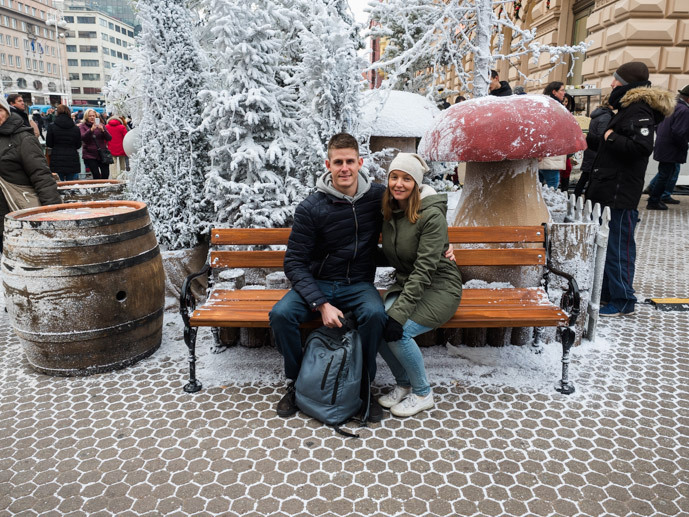 How Long Do I Need To Explore Zagreb Christmas Markets? Before I went, I assumed one evening would be enough to explore the Christmas market. But it took us a few days/evenings to really make our way through most of the different areas. So I would say to come for a full weekend to enjoy the Christmas market. 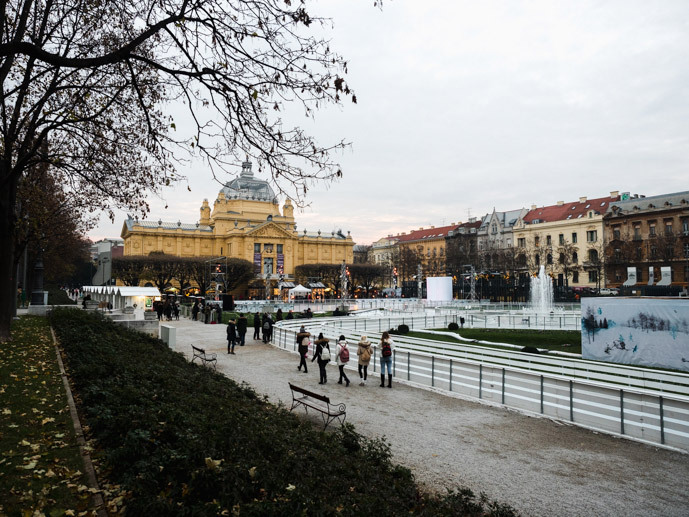 Also, keep in mind that Zagreb is a beautiful city itself, so make sure to leave time to explore Zagreb outside of the Christmas market too, so add on a couple more days if you have the time. One thing I didn’t realise, is how exhausting it can get exploring in the cold, so if you get some colder days, it may take you a little longer to see everything. 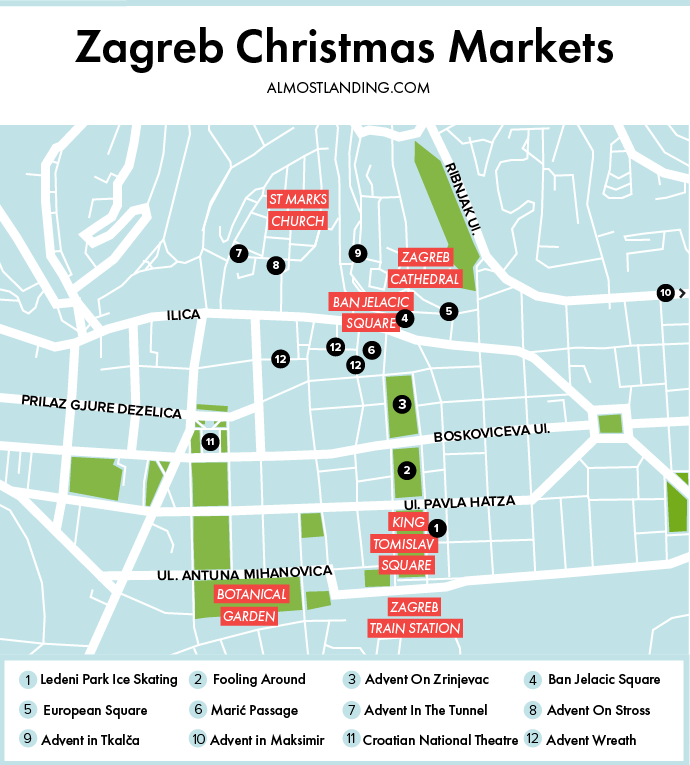 Here is our Zagreb Christmas Market map, so you can find you’re way around easily ( + printable pdf map at the end of the article). 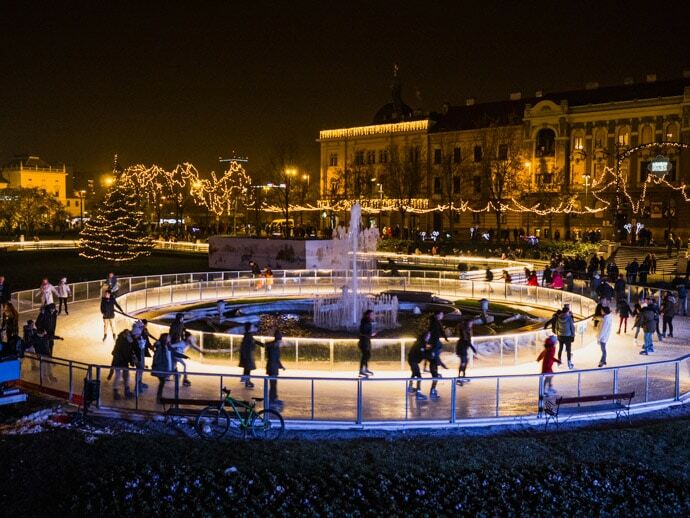 As mentioned, one of the best things to do at Zagreb Christmas market is Ice skating at Ledeni Park (which is at King Tomislav Square). One thing I’ve always wanted to do is skate on one of those beautiful outdoor ice skating rinks in the winter. Well, Zagreb Christmas markets have a beautiful one. I loved that it wasn’t just all in one place, like a normal ice rink, but it was like a circuit around the park and fountains, so you could do loops and it made it so much more interesting. I have only skated a few times before. It only occurred to me just as I was about to step onto the ice, when Chris suggested maybe I should start holding onto the wall, that perhaps I may not be able to make it around the circuit. And let me just say it took me at least 15 minutes of holding onto the wall before I found my skate legs. But, I think there were plenty of other people in the same boat. So make sure to give it a go, even if you haven’t skated before. 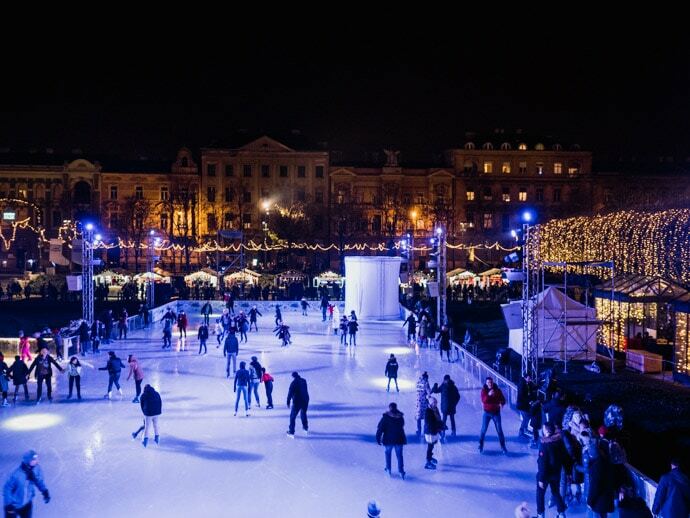 Price: 15 – 20 Kuna for Ice Skating (depending on session time) + 20 Kuna for Ice Skate hire per person (around $8.50 AUD per person including skates). There are also other types of tickets. See Ice Skating sessions and book here. 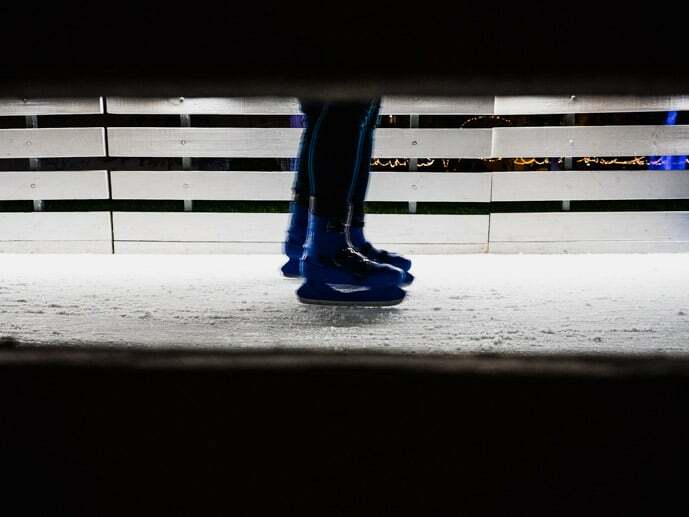 Things To Note: Ice Skating didn’t start until after the opening ceremony at the ice skating rink (7.45pm), so you may not be able to skate on the first day of the Christmas market (which was Dec 1st in 2018) or it may just be a late session. Credit Card is accepted. Just north of Ledeni Park is ‘Fooling Around’ or Fuliranje at Strossmayer Square. This is a cosy eating and drinking spot with music and DJ’s playing. 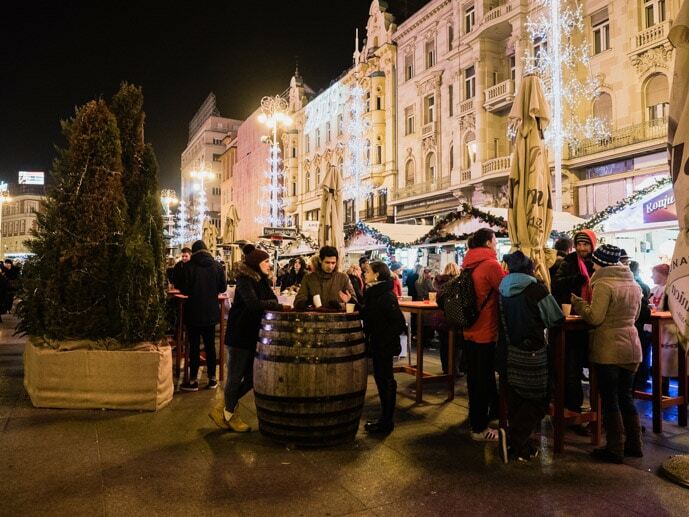 It’s the perfect spot to grab some mulled wine, with plenty of seats, and food stalls from popular restaurants in Zagreb. They even have an open fire to sit around if you’re lucky enough to get those seats. And just north of ‘Fooling Around’ is Advent on Zrinjevac. 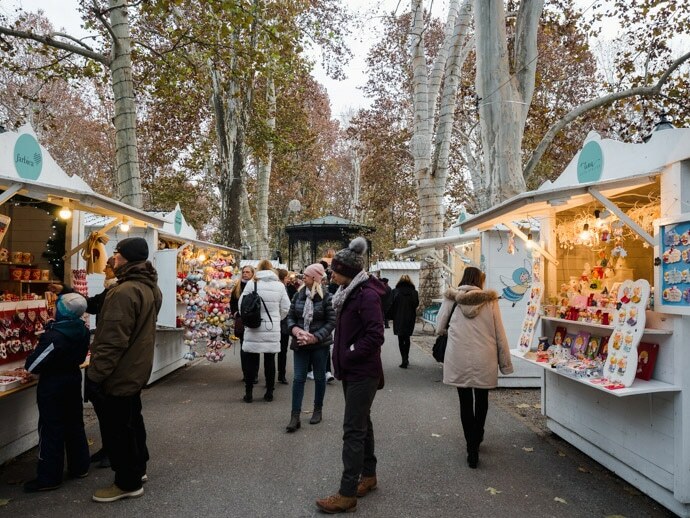 This is one of the most beautiful parks in Zagreb on a normal day, but at the Christmas markets, the path is lined with small stalls selling Christmas ornaments and other gifts. 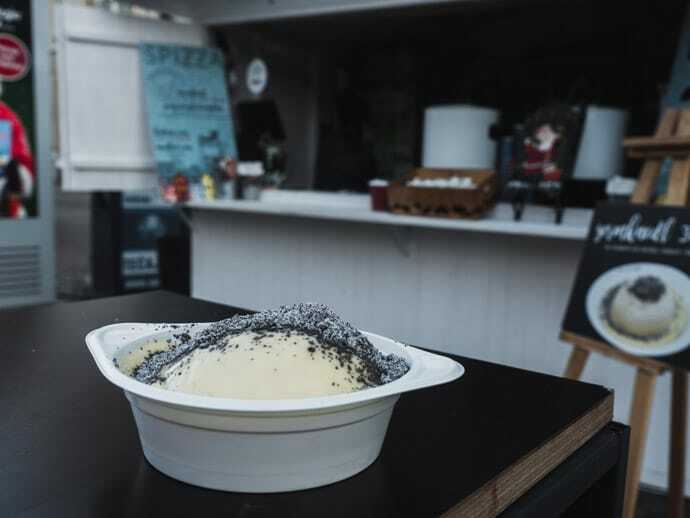 Towards the middle, you will also find some more food and drink options and live music playing in the rotunda at certain times of the day. You can check the schedule here. This area is nice to walk through, especially if timed with the live music events. It’s also the perfect place to pick up a Christmas gift. 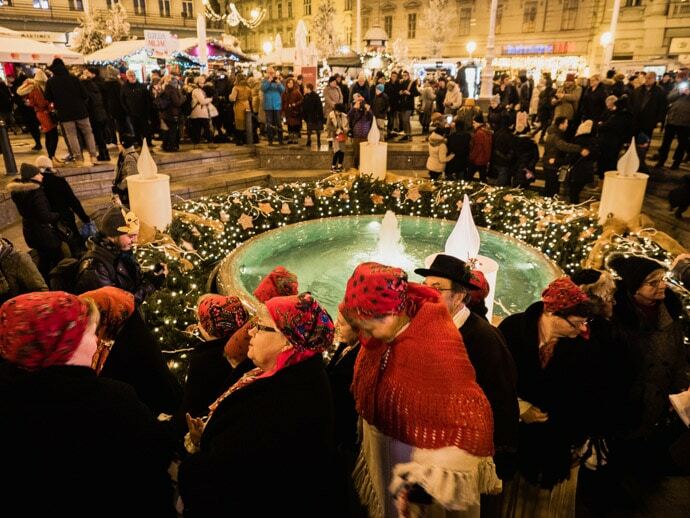 Advent on European Square is tucked in beside Ban Jelacic Square. 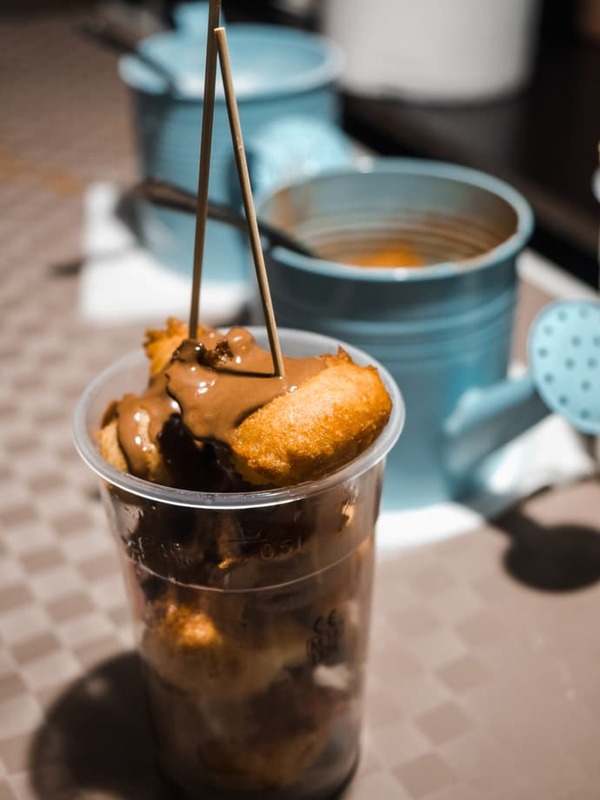 This is a great option for Zagreb Christmas market food, with everything from traditional dishes like Sarma (think sauerkraut cabbage rolls) to tasty Austrian Christmas desserts like Germknödel (fluffy yeast dumpling filled with spice plum jam, with poppy seeds and vanilla custard). We loved the Germknödel from the Spizza stand. 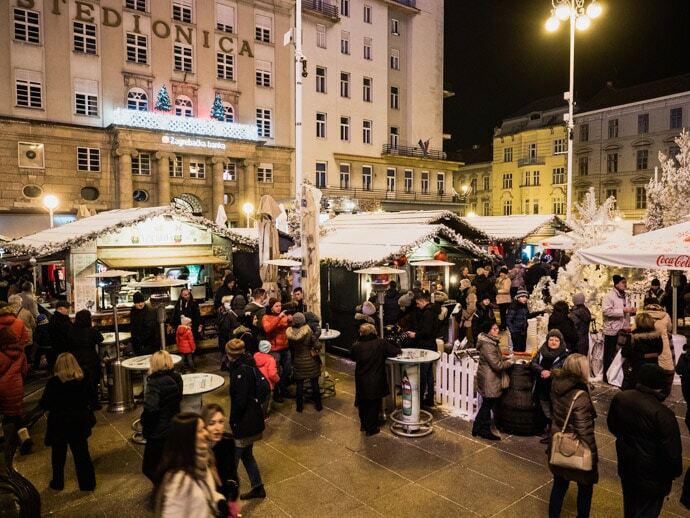 Ban Jelacic Square is the heart of Zagreb’s city centre and another one of our favourite areas for Zagreb Christmas Market food. 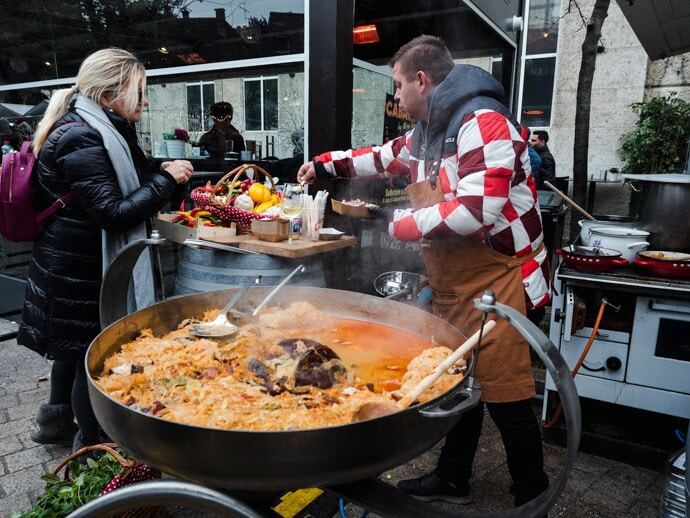 Here there are many stands serving sausages in rolls, mulled wine and fritules, among other things. I have to say the sausages are absolutely delicious. 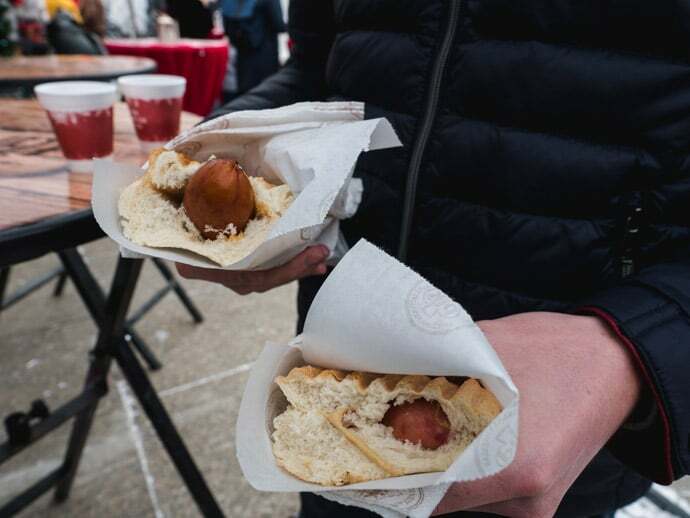 We loved the Kranjska sausage, a traditional smoked pork sausage, which also comes with the option of cheese inside. Another great option is the traditional Croatian Kulen sausage. You can see the program of events at Ban Jelacic Square here. Ban Jelacic Square also has some beautiful winter Christmas decorations, great for taking photos and capturing the spirit of the Christmas market. 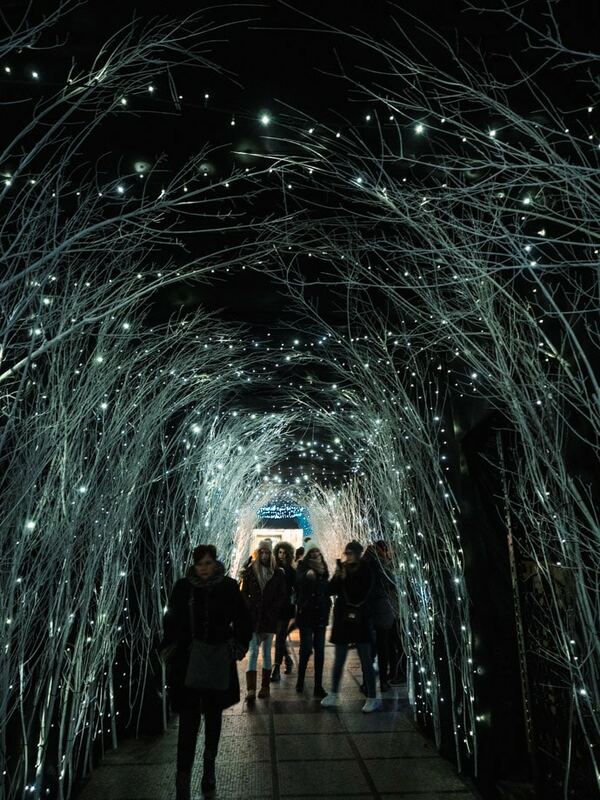 Advent in Maric Passage is quite literally a passage through a building that comes to life, covered in lights. Walking through here seems magical, albeit that can quickly fade with all the people stopping to take photos. You won’t need too long to see this passage, and it can be seen on the way to Advent on Zrinjevac or Christmas Tale at Ban Jelacic Square, as it’s not too far from here. This passage can be found at Praska Ulicia 6. This year, Advent in the Tunnel was split into two seperate time frames. The first couple of weeks is a museum of reality: UNICEF, whilst the last couple of weeks are Winter Garden. I love the idea of this, but I think it would work best combined, as I thought UNICEF was such a great idea that would be good to promote the entire time but perhaps lacking in terms of being a decorated stop on the Christmas market trail. Either way though, it’s still a great stop. This was perhaps one of my favourite areas of the Zagreb Christmas Markets. 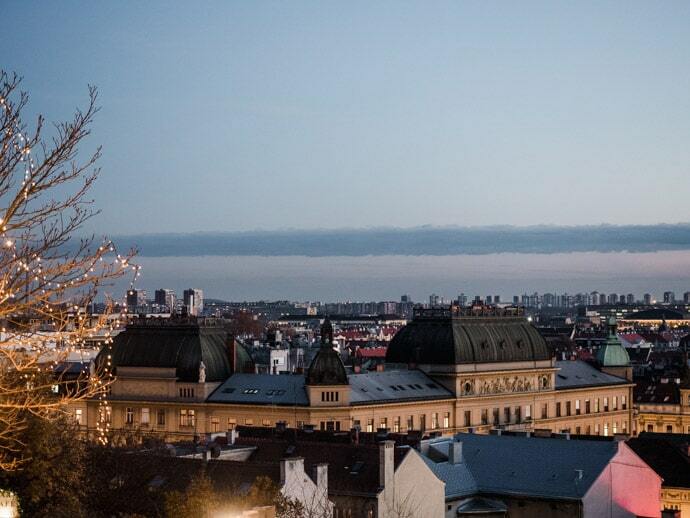 From Strossmeyer Promenade you can get some beautiful views over Zagreb, but with the Christmas lights and decorations, and the promenade lined with food and shop stalls, it’s such a beautiful sight. At 6 pm each night they have the lighting of 100 lamps. Or just head over anytime in the evening to see the beautiful lights and have a bite to eat. They also have a live music program here too. And whilst you are in the area, make sure to walk around to St Marks Church and see the stunning Christmas tree in front of it. Advent in Tkalca consists of a number of events that take place on Ul. Ivana Tkalčića, otherwise known as Tkalciceva street, a pedestrian street in Zagreb lined with restaurants and bars. You can see the date and time of events here. We didn’t make it to Maksimir Park for the Christmas market this year, but we have been to the park, and it’s such a beautiful place. 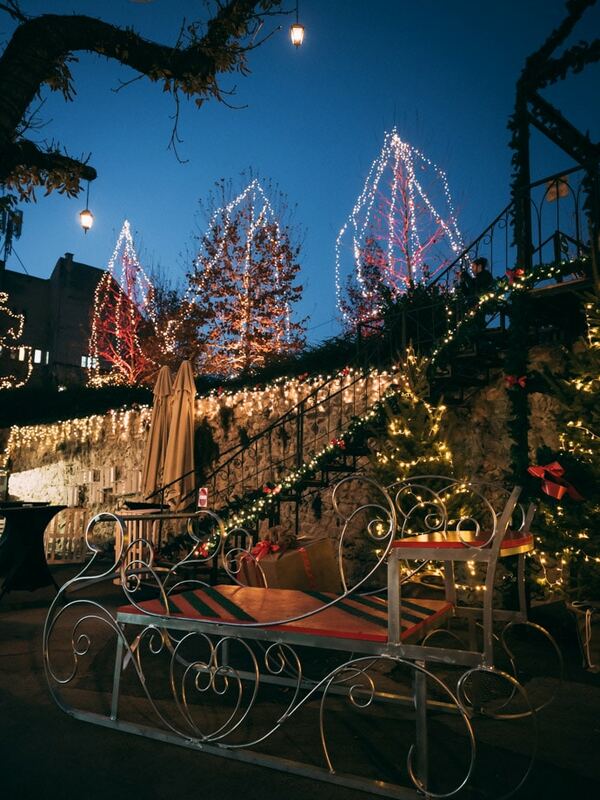 So I can only imagine it would be a great addition to your Zagreb Christmas market experience. 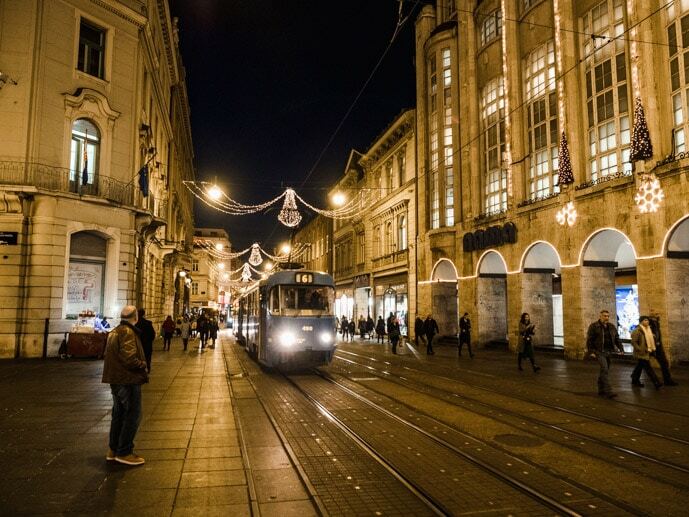 Keep in mind that it is a little further away, you will need to get Tram 11 from Ban Jelacic Square to make your way there (about 10 minutes). 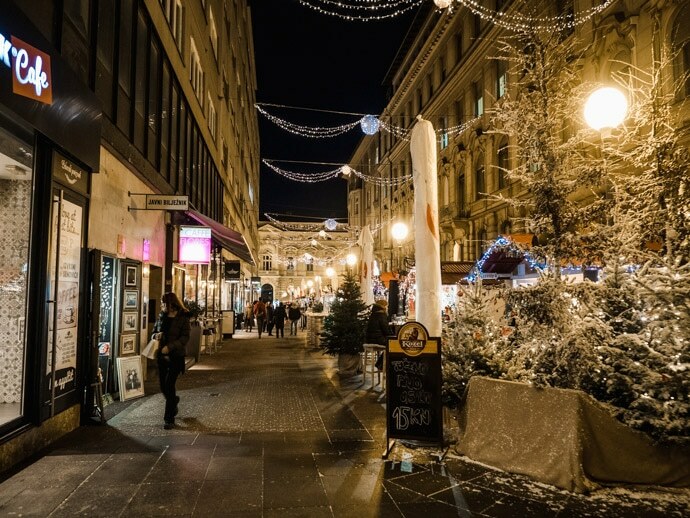 There are a few streets in Zagreb city centre lined with Christmas shops and food stalls, including Varsavska ul., Gajeva Ul., Bogoviceva ul. 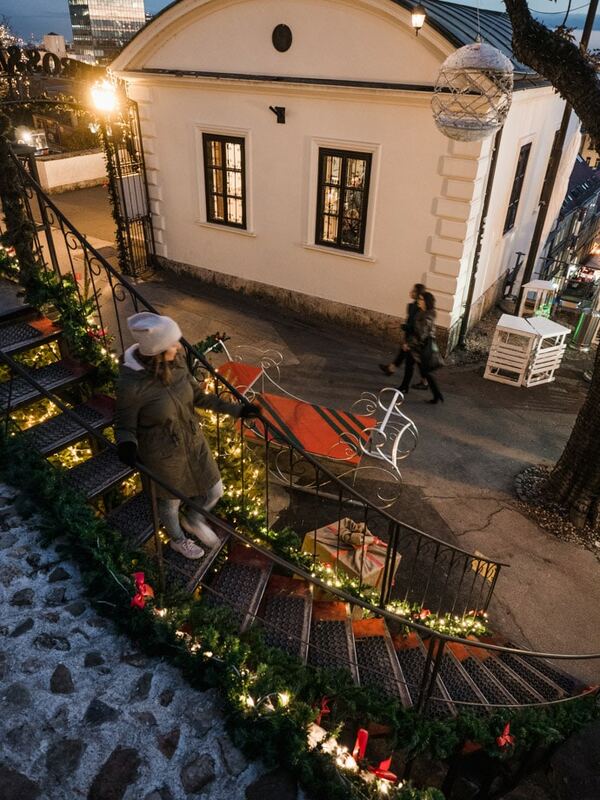 These are all easy enough to do between seeing other Zagreb Christmas Market locations. Here you can see live music performances on certain days and times, out the front of the beautiful Croatian National Theatre. Concerts from Balconies in Zagreb on certain days/times, by a 6-piece brass ensemble. 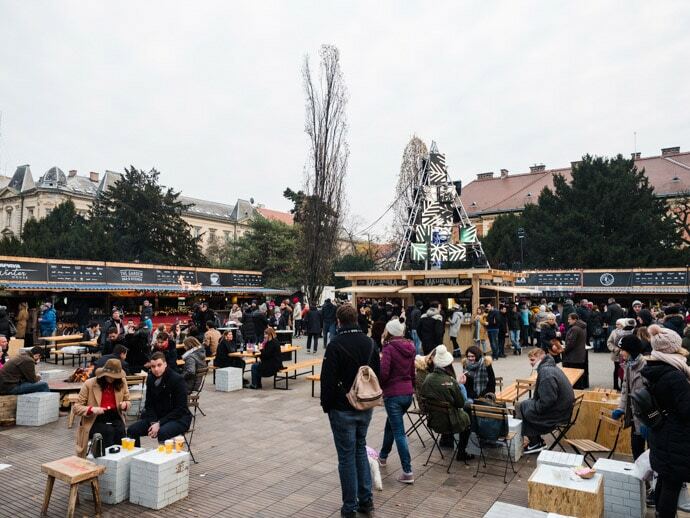 Zagreb Christmas market, otherwise known as Advent in Zagreb, runs from December 1st 2018 until January 6th 2019. For more information see Advent In Zagreb. You can get to Zagreb Croatia via train or flying if you are already in Europe. For all other destinations, you can fly into Zagreb International Airport, Franjo Tuđman Airport. If you arrive at Franjo Tuđman Airport, it is only a 30-minute taxi, Uber or bus into the city centre. There are many direct flights to Zagreb if you are already in Europe. 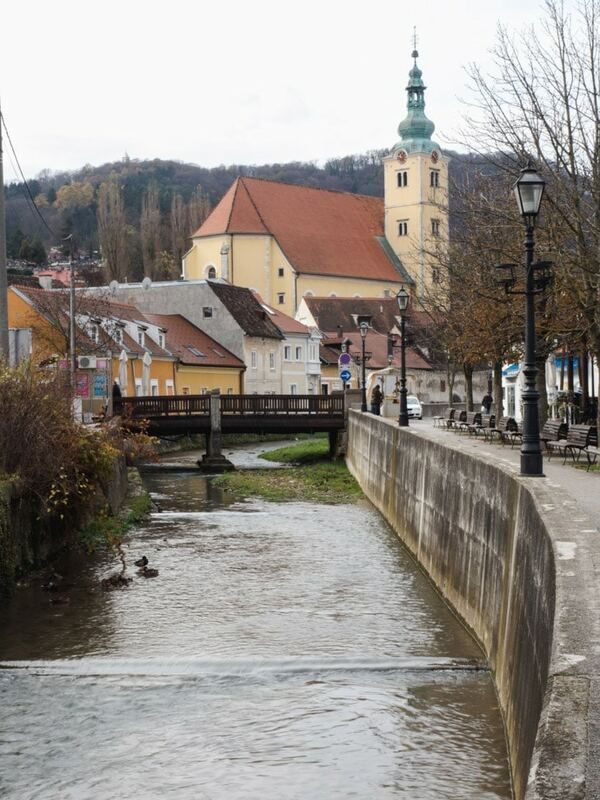 If you are coming from other destinations, you may be able to fly direct to Zagreb, otherwise, you can pick a nearby country such as Slovenia (Ljubljana), Austria (Vienna), Germany (Frankfurt, Munich) or Italy (Milan, Venice), and either get a short connecting flight from there to Zagreb or a train. Esplanade Zagreb Hotel – Beautiful 5-star hotel in a central location near Zagreb Train Station, Botanical Gardens and King Tomislav Square. Check Prices Here. Hotel Dubrovnik – 4-Star Hotel located right near Ban Jelacic Square. Check Prices Here. Hotel Academia – Well reviewed 4-Star hotel in a great location on Tkalciceva Street. Check Prices Here. Hotel Jägerhorn – Boutique hotel located on Ilica Street, very close to Ban Jelacic Square and Flower Square. Check Prices Here. 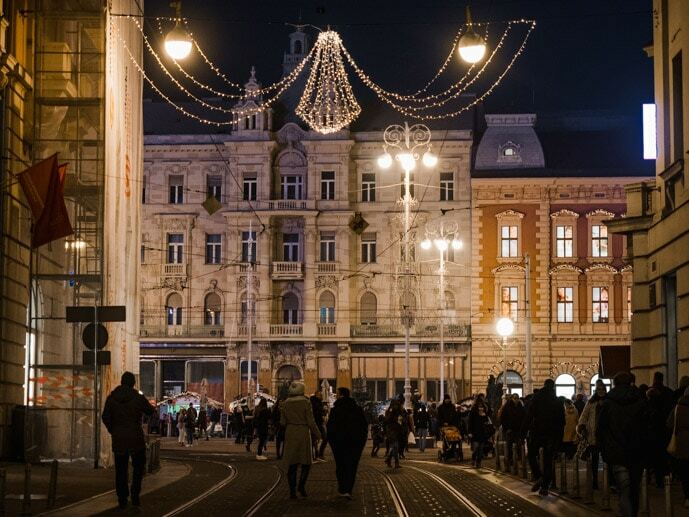 There are also some great options in Zagreb on Airbnb. Click here for $50 credit towards your first stay. 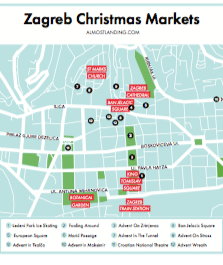 Get your free printable Zagreb Christmas Market Map (PDF) to take with you. We hate spam and promise to keep your email address safe. You will receive a travel email from us each week and you can opt out at any time.